"Equipped with electroluminescent wiring on the back and wheel speed sensor, it displays a bright numeric readout that states just how fast you're moving in no uncertain terms. It runs on a 9-volt battery for six hours, which is plenty of time to really show off how fast you can get going down those hills." Hills? In Winnipeg!? I didn't think Winnipeg had any hills. 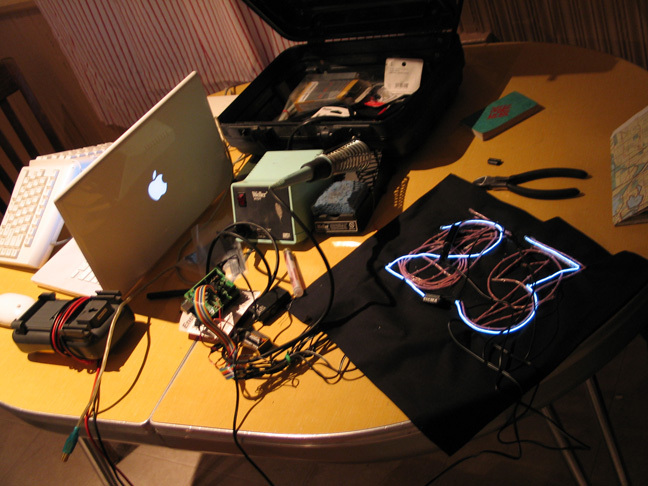 Anyway, great idea for using luminescent wire, I like it! Wasn't my design I just shared it here. Turd is right about Saskatchewan, but yes Winnipeg is just about as flat. I know, I lived there for a quite few years, as a kid. Mostly all I remember is the cold. Used to live on Barron Drive, in Westwood. I do remember both seasons, though...winter & July. I know what you mean... No snow yet but the big freeze will be here soon.